- Wield the Wrath of Olympus using super-powered new abilities that can turn the tables against your foes. Build up your Wrath Gauge as you fight, then unleash hell! - Battle the Fury Sisters, Alecto & Tisiphone, whose viciousness is such that even Lord Hades is reluctant to recruit their assistance! - Gain New Boons from each of the Olympian gods -- nearly 20 new boons in all, including new Paired Powers, granting the combined strength of different gods! - Confront New Foes, namely the Bloodless Burn-Flinger and Wave-Maker, whose ferocious attacks will disrupt your tried-and-true strategies. Plus, an awesome new music track, scores of new fully-voiced narrative events, balance changes, enhanced art and visual FX, and more! Full patch notes are available in the game client and at the Supergiant official Discord. The Murder Death Kill Update also includes the latest version of the Development Roadmap, accessible from the game’s main menu. May the Fates favor you, for Thanatos, Alecto, and Tisiphone will not! P.S. 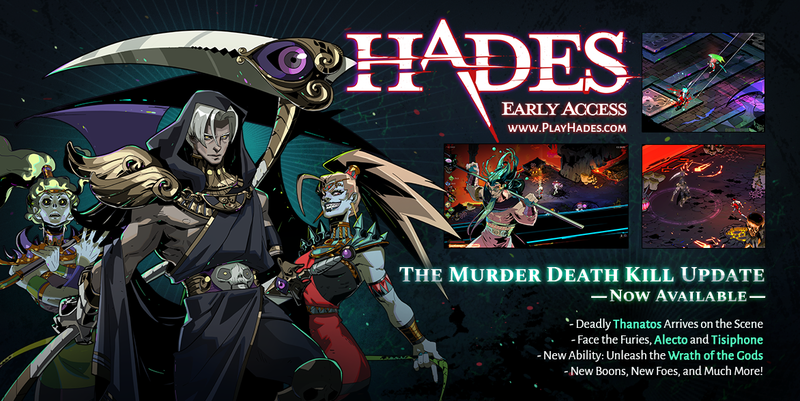 : Want to know what it's like working on Hades at Supergiant? Then watch the second installment of Noclip's one-of-a-kind documentary series about our Early Access development! Following our launch in December, this episode shows our ongoing efforts to build the game in partnership with our community.